It’s not that I JUST want to be a published author. It’s really not JUST about that. Yes, I think it would be super cool to have my work out there and be published and do book signings or whatever, you know? But really, my main goal of writing is to just get my writing out there. I can’t do that if I can’t even finish one draft of one story. Technically it’s the second draft because it’s the rewrite, but I won’t get into that right this moment. So, as many of you know, I participated in NaNoWriMo this past November and I wrote over 50k words to win. It was a tough month, trust me, and part way through I realized I didn’t want to write my story the way I was writing it, so I knew I’d have to do a rewrite of it eventually. Well I’ve been trying to rewrite this story in the perspective and tense and everything that I want for the past two months, right? I even set a deadline for myself and everything in my revision plans. I thought it would go over smoothly, but like anything, I’ve hit a bump in the road. Don’t get me wrong, I love my story and the way it’s turning out now that I’ve switched it up to what I wanted it to be, but I’m just struggling to find the motivation to keep pressing on and write. Well, I want to be able to finish my story and get it out there to the world, to share my creative voice and tell the story I want to tell. But I don’t want to stop there; I want to write as many stories as my brain can come up with. I want to be able to reach for the stars and share in the wonder that words can hold on a page. And so I think my first step, aside from the obvious finish at least one story, is to find the motivation to finish it. NaNoWriMo in November was something that was really motivational and challenging, giving me a set date and time in which I needed to finish up to or past 50k words in order to win. I think I need that challenge because I’m otherwise never going to finish it. 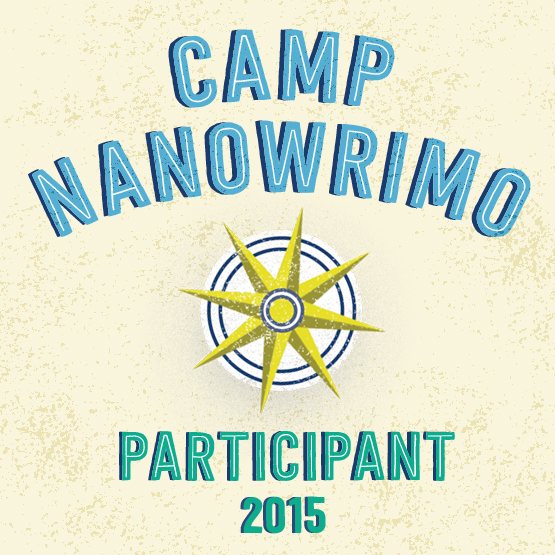 So NaNoWriMo doesn’t just happen in November, but they also do Camp NaNoWriMo in April. It’s a more relaxed version of their November one, where you can set your own word limit and write as many words per day as you can to reach that goal. Whether it’s your NaNo draft, your latest story, a comic book, or whatever other creative writing piece you happen to be working on, that’s what Camp NaNoWriMo is all about. So I think I’m going to participate and continue working on my draft of my November NaNo story. It’s fun and challenging to reach a word goal in a month, and April will be no different. My goal will still be 50k words, I think, and where I’m already at 10k words, I think I’ll do well, haha! If you need that extra oomph to write in the upcoming month, I’d definitely check Camp NaNoWriMo out. Sounds fun and a lot less stressful. This entry was posted in Fun, NaNoWriMo, Writing and tagged camp nanowrimo, creating, draft, fun, National Novel Writing Month, story, word count goal, writing. Bookmark the permalink.